Ribbed Knit Flounce Hem Dress / $35. I love the cut of this dress!!! It is so flattering, and I love the look of a white dress with a good tan and my favorite gold hoop earrings. You could rock this with flip flops or wedges on a beach vacation & it would look fab either way. I definitely want this for something wedding related! Gingham Wrap Dress / $18. This gingham wrap dress has amazing reviews & is in stock in sizes S-XL. I love the versatility of it- you could wear this with wedges for Easter Sunday or a hot date, or you could dress it down with these adorable $19 lavender sneakers for a fun girl’s brunch or shower. Palm Print Off The Shoulder Dress / $23. This dress reminds me of the brand Show Me Your Mumu…. at a fraction of the price!! I think this would be perfect for a night out with friends, or even for a spring/summer wedding with these $35 strappy heels. 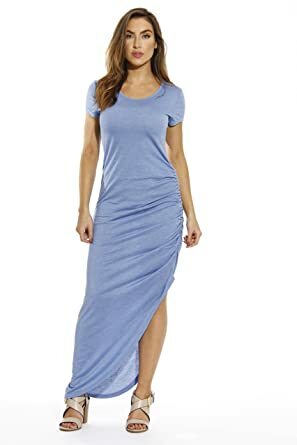 Casual T Shirt Dress with Ruched Sides / $20. So sorry for the blurry image; this adorable dress is from Amazon! It has amazing reviews & I love the idea of just throwing this on with my favorite $8 faux leather flip flops & air dried hair. The great thing about this dress is it goes from sizes Small to 3X Plus, so it’s perfect for all sizes! I also think that this dress is appropriate for all ages. It comes in several other colors including black and gray. 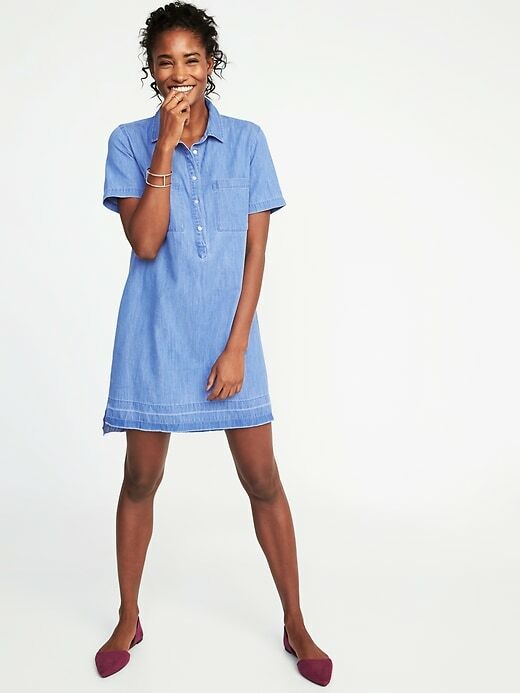 Released-Hem Denim Shirt Dress / $32. I have an older version of this exact dress and I wear it ALL. THE. TIME. It is so adorable & flattering!!! I’ve worn it belted, unbelted, with boots, wedges, sneakers, sandals. You name it. This dress is so versatile and I love how on trend this version is with the released hem look at the bottom. I think this dress would be so cute with these cute $18 sandals for casual days during the spring and summer. Olive T- Shirt Dress / $20. I’ve shared this before, but I wanted to share it again because I have this dress and LOVE it so much! My sister has the grey color and I have the green. I love this for spring with a jean jacket. Target is BOGO 50% off with dresses right now, so I thought I’d share a few that I have and love from there. These dresses are so cute in person!! Tie Waist Ruffle Sleeve Dress / $25. I have this dress in the gray color, and I promise you in person it looks like something that came from ShopBop or Revolve! The quality is amazing and the fit is great too. I got this in an XS- so size down if you are between sizes. This dress would be so cute with these $25 platform espadrilles. Blue Striped Tie Back Dress / $28. This dress is also part of Target’s Buy One Get One 50% Off Dresses sale. I saw this dress in store and it is so gorgeous!!! It gives me major Anthropologie vibes! I love it for baby showers, luncheons, or any spring get together. These are all awesome, Olivia! Do you think you could do a post with some longer summery/spring dresses as well? I have to wear below the knee for certain events and for work. Oh, that’s a great idea!! I love maxi and midi dresses for the spring! !